Three roll benders work by "pinching" the flat workpiece between two rolls and bending it as it comes in contact with a forming roll. This bends the workpiece into a cylindrical form, where it is welded together to produce a cylinder. Caps are then welded on to produce tanks. The upper roll is in a fixed position, the lower roll has adjustable movement to perform the gripping function. These are the "pinch" rolls. 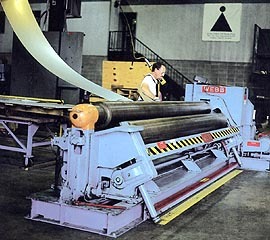 The third roll (the forming roll) is also adjustable. Many objects we see everyday are manufactured by the metal bending industry. Water heaters, aircraft engine housings, and a variety of tanks and curved metal structures are common examples. 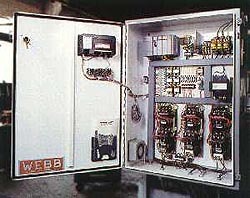 For decades, Webb has been manufacturing the machines to do this work, both three-roll initial pinch rollers and the newer four-roll hydraulic plate benders. Truly built to do the job year after year, these machines are designed with all three rolls driven. This insures easy material feeding and constant pull through of the workpiece. With a manually or air adjusted drop hinge, the top shaft is automatically raised to release the pressure on the rolled sheet when the tail hinge is lowered. The rear forming roll is adjusted manually on some standard models. Power adjustments can be furnished on all WEBB rear forming rolls. 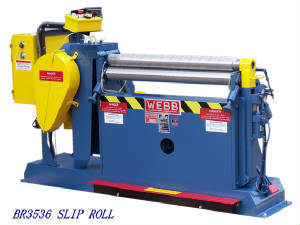 Step up to the latest technology with a WEBB four roll hydraulic plate bending machine. Easier for operators to use, giving accurate tolerances and precise workpiece positioning, WEBB's newest models are great for repeatable requirements. 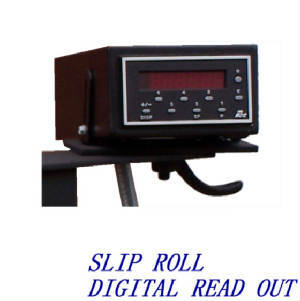 In a four roll hydraulic bender, the top and bottom rolls are the "pinch" rolls and the two outer rolls are the forming rolls. This gives two major advantages over other machines. Material can be formed from either direction in one pass, eliminating extra steps. 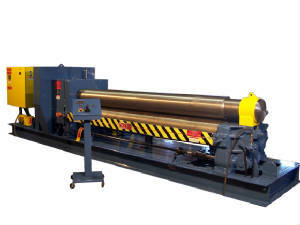 Plus the four roll machine has the capacity to prebend the leading and trailing edge of the material without removing the workpiece from the machine. By using a four roll double pinch machine you can save time and money on the production floor. Duplicate runs of the same cylinders are easy to set up, perfect for high volume production. WEBB's four roll hydraulic benders are built with the same attention to detail, top quality material and heavy duty construction that is a hallmark of all our products. Digital readouts, fully adjustable speed control, heavy duty planetary gear reduction units; WEBB's four roll bender bring you the latest in technology.